M77 (aka Arp 37) is a nicely detailed galaxy located in the constellation Cetus. The galaxy is the brightest of all known Seyfert galaxies - a type of galaxy with a very active nucleus that generates a prodigious amount of energy, particularly at radio and infrared wavelengths. 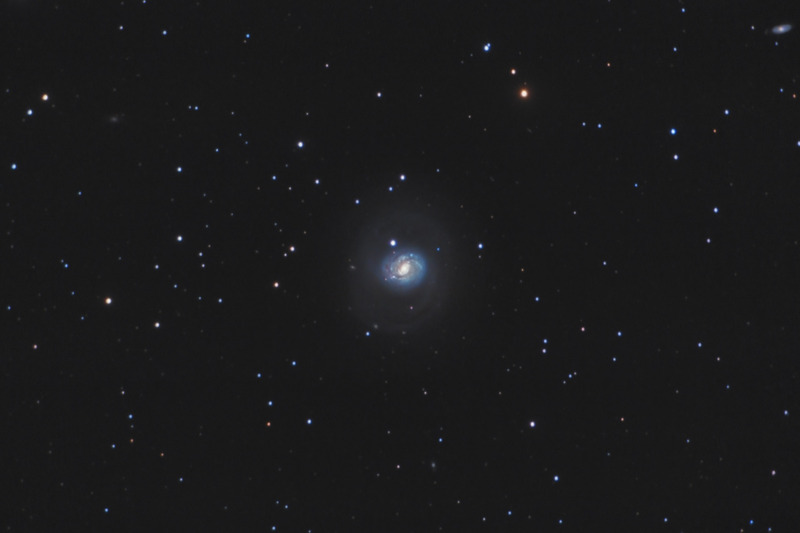 M77 is a very large galaxy - it is estimated to be about 170,000 light years in diameter. Be sure to click on the image to see the high resolution image. 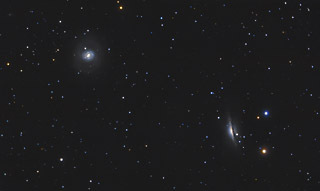 In addition to the 3 small galaxies shining through the halo of M77 and the spiral galaxy NGC 1072 in the upper right corner of this image, you should be able to spot a handful of nice background galaxies scattered throughout the image. In this image, North is to the right. This image is cropped to 63% of the original full frame. Software Used Images Plus 4.5 for camera control, calibration, stacking, digital development, multiresolution sharpening, smoothing and noise reduction. Photoshop CS5 used for levels and curves, color correction, selective color, high pass filter, star shrinking, lab color, saturation adjustments, screen mask invert, lens correction, and smart sharpen. Gradient Xterminator for gradient removal. Carboni Tools for additional saturation adjustments, noise reduction, and smoothing. HLVG for additional color correction. Notes I'm very pleased with this image. Although the conditions I had while imaging it were fair to good, I was able to capture some good detail in the galaxy core. I was also happy with the amount of the faint halo shown in the final image.